fantastic value, a little goes a long way! 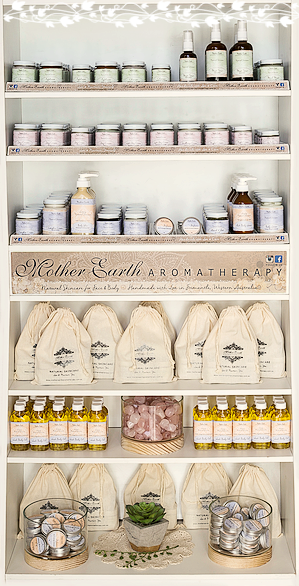 Mother Earth Aromatherapy, was born from a desire to create a 'TRULY NATURAL' Skin Care Range, which is vibrationally balanced. Designed to assist you, to love and nurture you! Our products are hand crafted, in small batches, to ensure freshness and quality. Give yourself the gift of self-love. We aim to create Natural Aromatherapy Products with integrity, using the highest quality ingredients, with love and care. Our luxurious products are handcrafted using chemical free and organic ingredients, direct from Mother Earth! Located in South Fremantle, Western Australia, we supply health, pharmacy, gift stores and salons Australia wide, and of course, you can browse the range here. Mother Earth Aromatherapy can Custom Design and manufacture a Range of Products especially for YOUR BUSINESS, specialising in short runs. Contact us or call our Aromatherapy Studio for more information.